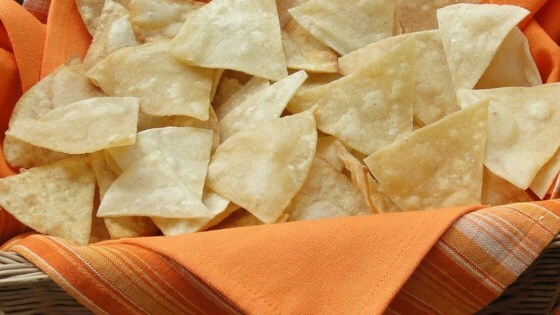 "Here's a simple recipe for making corn tortilla chips spiced only with salt. The chips may alternately be prepared by baking the tortilla wedges in a 350 degrees F (175 degrees C) oven for 5 minutes, or until crisp." In small batches, fry the corn tortilla wedges until crisp. Remove from heat and drain on paper towels. Salt to taste while warm. I don't have the patience to fry tortillas. I just fire up the double ovens, spray the tortillas with butter flavored Pam (on both sides) and put them in the oven, turning once. These are great--to make them healthier, I sprayed them with butter-flavored cooking spray and baked them at 425 until they started to brown--wonderful crunch!